If you’ve never heard of gaga ball, you’re not alone. But to millions of kids around the world, it’s the hottest game on the playground right now. The game, played in an octagon pit, is simple. Similar to dodgeball, the goal is to be the last one standing and players use a soft foam ball to knock out their opponents. Gaga ball is a fast paced game that keeps kids on their toes. Once in the pit, players hit the ball with one open or closed hand without throwing, carrying, or dribbling. Players are out if the ball hits them below the knee at any time. The best part of the game is how inclusive it is. You don’t have to be the tallest, the strongest, or the most athletic to join in the fun. The games also have a fast turnover so everyone can have a turn, and even after getting knocked out, it’s not long before you can jump back in again. That’s why when a local Girl Scout troop contacted PartnerShip about helping to sponsor their gaga pit project, it was an easy decision. Supporting our community is important to us and providing a place where kids of all abilities can come together is a great way to do it. The Girl Scouts of Troop 168 in Westlake, Ohio saw a need in their community for something that would bring kids together and make everyone feel included. Girl Scout Tina Cirincione said she first learned of gaga ball from camp and knew it would be perfect for their Silver Award Project. From there Tina and her troop members began developing a plan. They researched possible locations and reached out to members of the community to put their plan into action. 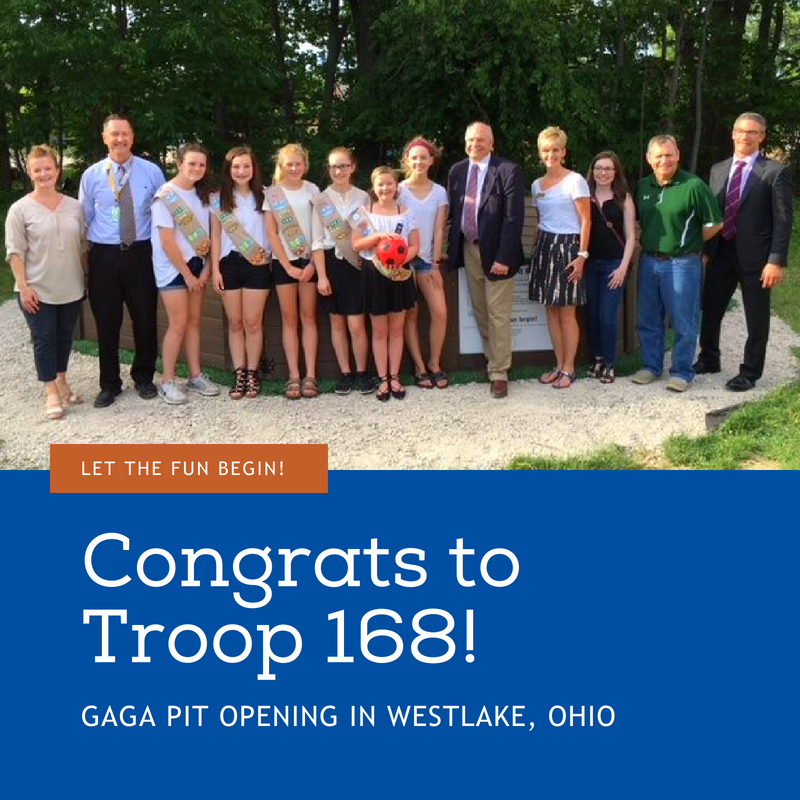 By working with the city of Westlake and Westlake City Schools, Troop 168 selected the grounds of Dover Intermediate School to build their gaga pit. This is the first gaga pit in Westlake – a huge accomplishment for the girls and their school. On a beautiful spring day, the gaga pit officially opened. At the site on Dover Intermediate School grounds, the Girl Scout troop invited everyone who supported their project to join them as they celebrated this addition to their community. Members of Westlake City Schools, Mayor Dennis M. Clough, and other community leaders joined the troop to celebrate. The members of Girl Scout Troop 168 were beaming with pride while Mayor Clough congratulated them on a job well done. Then it was time to jump in! The girls played the inaugural game and it was immediately apparent how much fun they were having. Even the adults played a round, proving it truly is a game for everyone to enjoy. Now that the gaga pit is open to the community and in a location that makes it easily accessible to kids in the area, it’s sure to attract a lot of activity. There aren’t many games that bring kids together the way that gaga ball does. Most organized sports require a certain skill level or will separate boys and girls. The way gaga ball is played allows for kids of all different backgrounds and skills to play together. Sports play a very important role in developing self-esteem, improving social skills, and staying active so having a game that can include kids that may otherwise miss out is a huge win. Girl Scout Troop 168 did an amazing job on this project. From gathering support, to making a plan and building the gaga pit, they put in a great deal of hard work. What Girl Scout Troop 168 did for their peers can serve as a lesson for all of us. Supporting your community in a small way can make a big difference.